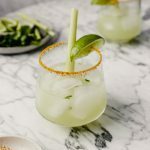 Lightly sweetened, this flavorful margarita is a Thai-inspired take on the classic tequila cocktail. Flavored with fresh ginger, lemongrass and cilantro (or Thai basil), this marg is easy to make and fun to serve! Combine salt and curry powder in a shallow dish. Cut a small slice horizontally through flesh of lime wedge then run around rim of a rocks glass; lightly dip rim in salt mixture then fill with ice. Muddle agave, ginger, lemongrass and cilantro in a shaker until thoroughly smashed, about 1 minute. Fill shaker halfway with ice, add lime juice, tequila, and liqueur secure lid and shake vigorously until thoroughly chilled. Strain margarita into prepared glasses, top with a splash of club soda and garnish with lime wedges, lemongrass and cilantro or Thai basil (optional). If you like sweeter cocktails, increase the agave to 1 ounce or add an additional ½ ounce of orange liqueur.